SAP, Oracle, Microsoft, Tally ERP, Sage, QuickBooks? Management of orders at different stock points is a critical part of any sales and distribution system. Days are gone, where the customer usually provides the purchase order to stock point and the data entry operator at stock point punches the order in the system, and converts the same to sales order. This system is now replaced with highly efficient integrated supply management system, where the customer electronically generates/transfers purchase order to stock point, which in turn, just converts the same into a sales order and process the sales order. EOMS allows field force to manage large volume of retail customers/wholesalers spread over large geographical area effectively. For generating the order, EOMS also offers capabilities to refer to historical purchase pattern as well as actual stock and sales data at customer end. There are various methods incorporated to efficiently consolidate customer stock and sales data (secondary stock and sales) in EOMS using online interface for excel based data transfer OR email based automatic data consolidation. Field Force can get information on order status, dispatch status as well as pending orders. Tertiary customer can be linked with secondary customers and in turn to primary customers for order servicing. EOMS can also be extended to Patients to book the order directly to Chemist/Prescribing Doctors. Auto order facility is also available which automates your order based on historic order patterns. Scheduling an order facility can be very helpful for the patients with chronic diseases. 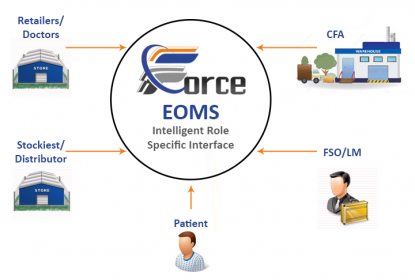 EOMS – order management software seamlessly allows users to create orders in a quick and efficient manner and provide required alerts based on historical sales or secondary stock and sales data if available. For example, if inventory norms at customer are 45 days, and order quantity exceeds inventory norms, the system will flag the user with the alert. Each order passes through workflow based on who is the originator of the order. For example, if field force has entered the order on behalf of the customer, the order can still go to customer for his authentication before transferring to order processing system. EOMS can be mounted on various order processing systems or integrated ERP systems like SAP, MS Dynamics and core EOMS itself. Generic n-tier architecture ensures that system can be used to manage orders further for tertiary customers and provide seamless order management platform for entire distribution chain. Order management software is optimized for usage on mobile Apps as well to make sure order booking is convenient from smart phones and tablets as well.